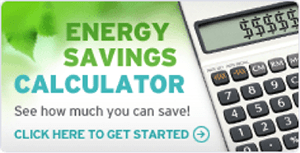 The most advanced solar pool heating system in North America. Utilizes hi temperature solar vacuum tubes with a stainless steel heat exchanger. The complete system is easy to install and will last for 20 plus years. 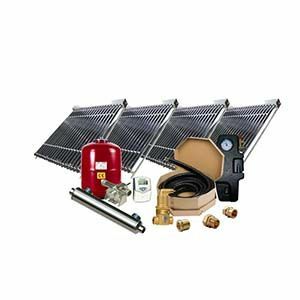 Unlike most solar pool heating system our solar pool heaters use solar vacuum tube. Other system use cheaper black polymer plastic tubing. The problem with the plastic pipe systems are very simple. The sun breaks down the plastic from the outside and the chlorine eats the plastic from the inside. 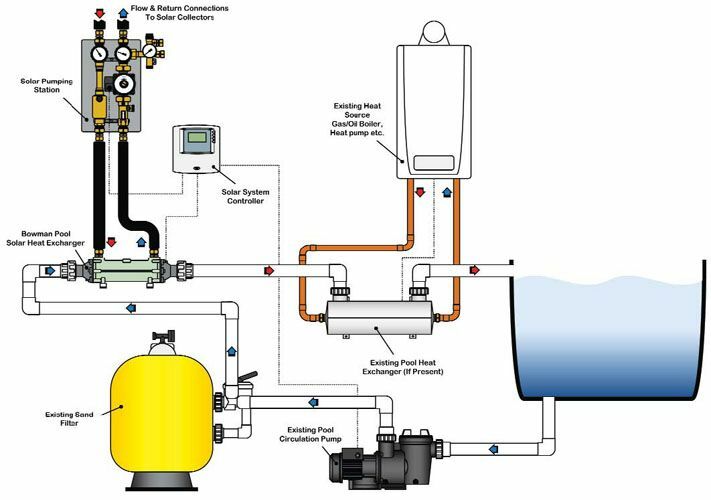 In our solar pool heating system we use a pressurize closed loop that separates the solar heating fluid from the pool water through a stainless steel or titanium pool heat exchanger. By using solar vacuum tubes you are able to heat a pool even when the air temperature is colder than the pool. This happens lots in Canada and Northern USA! 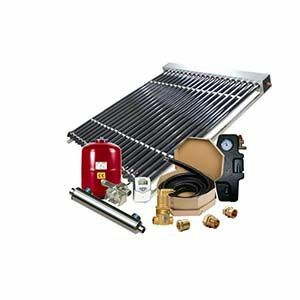 Vacuum tubes also work even in cloudy conditions or with light rain.These solar pool heaters can be installed as a DIY system or by your own plumbing contractor. Alternatively contact us and we can put you in contact with some installers who could help you out. Our Solar Pool Heating system can also be combined with a solar hot water heater which now maximizes your investment to 365 days a year. Stainless Steel Heat Exchanger prevents damage from chlorine pools. Easy to install! Simply connect the exchanger to your system after the pool filter. Payback can be a year or 2 if you install it yourself.... see below for details. Solar pool heaters work by adding heat to the pool slowly over a long period of time. Its not going to heat the pool in one day. As a test case, We added a SPH-4 (4 collector system) to an indoor pool measuring, 38 x 18 ft with no other heating system on it. In this case the 4 solar pool heaters heated the pool from 62 Deg F to 81 Deg F in only 10 days during May 2011. The solar pump station was set to divert excess heat once the pool reached 85 Deg F. The excess heat was then diverted to heat the the Hot tub. If this pool was only to be used in summer then one or two x 30 tube solar collectors would have been sufficient. However, in this case, 4 x 30 tubes solar collectors were added to allow more heat to be collected in winter to keep the pool warmer in winter months and also to help heat the hot tub. As a rule of thumb we recommend one TZ58 1800 30R collector for every 100 square feet of surface area. Remember this is only a rule of thumb and location, wind and shading also play an important role. A pool cover is also very important. So, if you have an indoor pool (or outdoor pool) you can use the pool as the primary place to put the heat from the solar collectors. Then any extra heat can be diverted to something else, lets call this the "secondary heat use"
This "secondary heat use" could be almost anything you want, for example. What this means is that if you plan the system from the start, you can add one or two 30 tube collectors to heat your pool, then later on you can simply keep adding collectors as your budget allows. The pool will still be heated but the extra heat will keep extending the season your pool will be warm then any excess heat can be used elsewhere in the home or business. AS this is a closed loop glycol system it can be used in periods of freezing conditions. This means you can start heating your pool earlier and keep it running latter in the season. If you shut down your pool in the winter you now have the choice to use the heat energy to a second heating application such as domestic hot water or home and space heating. If you don't want to use this energy then we simply suggest that you cover the collectors or purchase our specially fitted solar covers. More and more we see pool owners converting to salt water to aid in the cost of sanitization and provide a better experience. Salt water can be a problem in most solar pool heaters as it will increase the deterioration of the plastic mats. 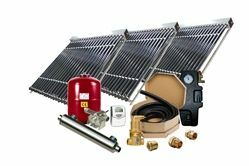 However by adding a titanium solar pool heater upgrade, you can give your self the extra protection. Unlike stainless steel, titanium does not break down when in contact with salt water. Uses your existing pool equipment. The existing pool pump runs most the day anyway. So all you need to do is insert the solar pool heat exchanger after the pool filter. The heat exchanger has 2" fittings suitable for most pool. It is designed as a high flow heat exchanger so that it does not decease the system flow. In some case you may included a diverting valve that can be opened to allow most the flow to go through the solar pool heaters while allowing some water to bypass if flow is an issue. 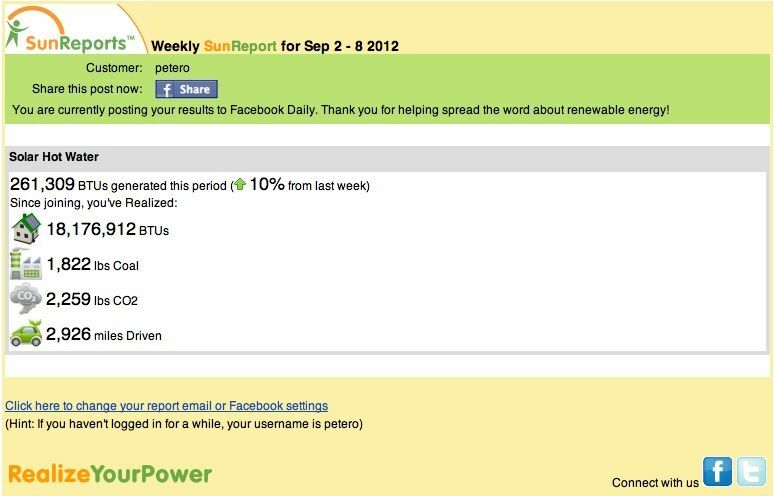 Average 1762 Watts in Canada - Each 30 tube solar pool heater has a power output of 1762 Watts. Over 7000 BTU / hr peak power output. Collectors capture over 93% of all sunlight and turn that into heat you can use to heat your pool. 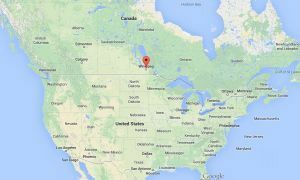 This report is showing one single 30 tube solar collector in Calgary, Alberta has produced over 18 million BTUs of heat in approx 18 Months. 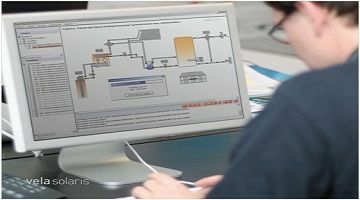 You can visit the live solar energy monitoring system for this collector by visiting this link. Solar Energy Monitoring live link. "UN GLAZED" solar heaters come in many different forms. It simply a dark plastic boxs of flat plastic mats that warm up in the sun, essentially no different from leaving a plastic bucket in the sun. They are simple and effective in specific conditions. These unglazed pool heaters work great only when the outside ambient temperature is higher than the water you are trying to heat. What this means is the suns temperature HAS to be warmer outside than your pool. If it is cooler, then the unglazed pool heater do not work. Also any wind blowing over the plastic pool heater will cool down the plastic pool heater like a radiator and actually remove the heat energy from the pool. Glazed Vacuum tube solar pool heaters can and do work even when the outside temperature is well below zero (-20, 30 or -40 Deg C !!!). The tubes are a glass vacuum, effectively like a thermos flask for your coffee, it holds heat into the glass tube even when it is cold out. In addition the glass thermos means any wind blowing has no effect on the heating of your pool water (unlike the unglazed heaters). In fact in Southern California in windy coastal locations with daily sea breazes, traditional solar pool heaters do not work even during high temperature sunny days as the wind removes the energy faster than it is absorbed! The glass collects and concentrates the sunlight, is not effected by the wind and will heat the water even when the outside temperature is colder than your pool. This is how the glass tube pool heater can extend a pools season. In a normal solar pool heating system, the pool pump is given the added burnden of pumping the water the extra distance and vertically up onto a roof top. A conventional solar pool heater uses an open loop. This means it is open to gravitational forces and as such the pool pump needs to overcome this added force. In a normal pool setting, the pump produces about 30-50 GPM. This is equivalent of nearly on 45 gallon drum ever minute. Can you now imaging the amount of energy required to move this volume of water to the roof!!!! A pool pump is not designed to lift that distance and as such you may have to increase the size of your pool pump (extra operating cost) or find your self calling your pool repair man often to replace pumps. In a closed loop pool heating system the pump has no gravitational forces to over come. The only forces present in a closed loop are the frictional forces of the piping and fittings. As such as much smaller pump can be used. Our solar pumps draw as little as 30 Watts per hour or less than 1/3 the energy required to light a light bulb. 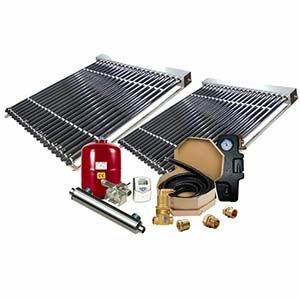 Solar Vacuum Tube Pool Heaters Last! The unglazed pool heaters have a much lower heat output per area, ie one of our solar evacuated pool heater have an area of about 50 square feet, however even if you get 50 square feet of unglazed pool heater, the evacuated tube solar pool heaters will produce many times the heat even when the outside temperature is very low. 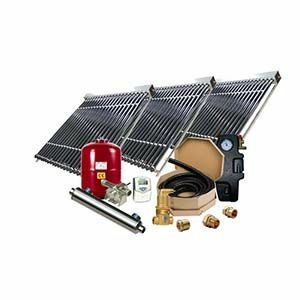 Because the solar pool system is separated from the pool system, there is no contact with the chlorine or bromine that would otherwise damage the solar pool heating system. This means that a typical solar pool heater using a closed loop system such as our, while outlast a traditional plastic solar pool heater by up to 5 times!